Trust not just your children to make informed choices, but trust the process of Life itself! A friend called me saying his adult daughter who is in her final year at college does not speak much to him or his wife. She keeps traveling on some pretext or the other and prefers to be aloof. She does not seek any advice nor does she offer much information. “I am aware that she is making her choices without involving us because she feels we may not approve of her decisions. But in letting her just be, am I failing in my duty as a parent,” he asked. Good question. Parenting is always a full-time job no matter how old your children are. With adult children there is always a question of having to respect their privacy. This is a conundrum that every parent faces. So how much involvement must parents show in the lives of their children, especially if the children are young adults? Let me share from our own experience of parenting. Vaani and I have kept our equation with our children simple. We have let honesty be the primary basis for all conversations. In any situation, we offer our perspective – not necessarily our opinion – and we leave the final choice to Aashirwad (26) and Aanchal (22). By perspective, I clearly mean we share what we have learned from Life in the given situation. We don’t ever say our way is the only way to have dealt with Life. We say: “this is what happened with us, this is how we dealt with it; it is up to you if you want to borrow from our experience.” We have always maintained that there is no right way or wrong way to live Life; there are no “our generation” or “your generation” issues; so we, in a way, have always encouraged experimentation and learning. Yes, on issues relating to values – integrity, compassion, respect for individuals – or non-negotiables – like drugs or drinking and driving – we remain unflinching and ruthlessly discourage any deviations. This approach has worked for us greatly. Aashirwad and Aanchal have always made their (informed) choices in Life, they have always kept an open channel of communication with us and important, they know that irrespective of the choices they make, they are always welcome back home should all that they try ever fail. I believe that in dealing with adult children we must accord them the dignity as individuals and their privacy must be respected. If an adult child chooses not to discuss something with you it must be seen as one of two things – either the child does not trust you or the child wants time to herself or himself to sort things out. Either choice must be respected. Yes, if the child does not trust you, it is very important to understand why – but it is important also to recognize that the mistrust has crept in over time, over honest conversations not having been had. Parenting is a blessing. But it is never easy. So, whenever in doubt, I simply lean on the one God of parenting I know – Khalil Gibran – and his wise words. They help me anchor in peace and learn to trust not just my own children better, they help me trust the process of Life itself! Adulting is simple if you are ready for everything! A switch in attitude is crucial to “handling adulting s**t” as you enter your 20s! The other day, at a café, I overheard two young people in their early 20s talk about how complex adulting is. They shared with each other the challenges of having to manage paying their bills, balance their cash-on-hand situation, their pay slips and tax returns; and also plan their investments in gadgets, vacations and wardrobes. It wasn’t that I was eavesdropping. But they were talking loudly – enough to distract me from checking Facebook on my phone! One of them added that she wasn’t ready for marriage yet because she wasn’t quite sure she could handle all this “adulting s**t”! “I can’t now start raising babies when I myself have not grown up from being a baby,” she remarked. I found the whole perspective amusing. I met Vaani when I was 19, I proposed to her when I was 20 and we married when I was 21. We had Aashirwad when I was 23 and she was 24 – she is a year older than I am! I don’t want to sound like a boring old man now and say how small our monthly income then was and how we managed and blah! But instead I want to say that adulting is so much fun. I guess it clearly depends on how you look at it. Having been under the watchful care of parents for almost 20 years (I always feel Indian parents too should embrace the American way of sending away their kids into the big world when they turn 17), our children tend to take for granted a sense of security. This, besides the fact that almost everything – housing, food, out-of-pocket expenses and education – are taken care of. There is always this attitude that most urban Indian children, coming from middle-class and upper middle-class backgrounds, have: they are groomed, raised and tuned to ask, is everything ready for me? When they step into independent adult Life, they are perhaps not even attitudinally ready. They ought to be thinking, feeling and saying, am I ready for everything, in fact, anything? This orientation, this switch, is crucial to be adult-ready! I believe as parents we have to engineer this switch in attitude. No serious preparation is required. Just honest conversations – not only on how money is earned and bills are paid, but also on relationships, the upheavals of Life, on compassion, love, loving, relationships and the Purpose of Life itself. We did that a lot, and still do that, with our children Aashirwad and Aanchal. When Aash went away to University of Chicago he was barely 18. He wasn’t ready then to absorb perhaps everything that we were sharing with him, but his “adventures through adulting”, I guess, helped him connect the dots. For Aanchal, just her physically being with us as we navigate a tumultuous, cathartic phase in our Life, (read more here: Fall Like A Rose Petal), helped her grow into being adult-ready. She had to often jump in and take charge, which she always did, apart from watching, from close quarters, how real world challenges are faced and dealt with. The whole process of parenting and grooming adult children is not at all as complex as it appears to be. And I repeat, adult Life is a lot of fun! The simple change in attitude that we must all encourage in our adult children and what they must embrace is this: stop asking is everything ready for me and instead ask, am I ready for everything, anything? Life is inscrutable – we all know that. So, the best way to meet Life daily is to be ready, and willing, to accept everything that comes your way! This is not specific to adulting at all. This is what Life is all about. But since this lesson is never openly shared in the course of everyday conversations in our homes, our children aren’t oriented to look at Life this way. Just that switch in perspective can make their adulting experience so much richer, so much more enjoyable! 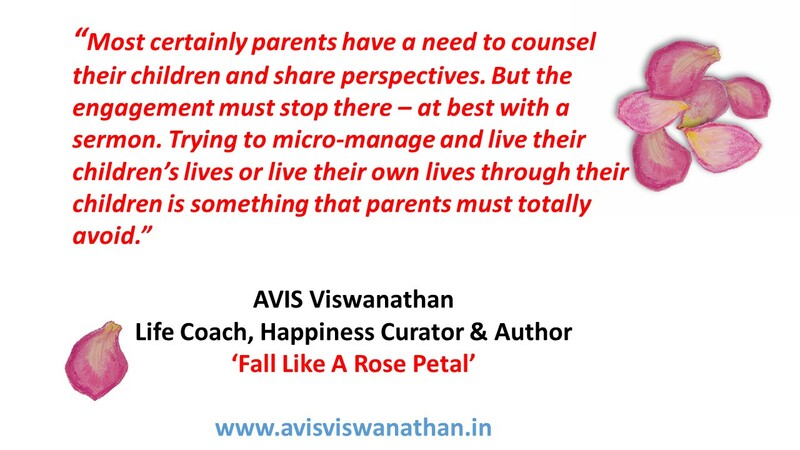 Author AVIS ViswanathanPosted on January 23, 2017 Categories Life, Parenting, Responsible Parenting, UncategorizedTags Aanchal, Aashirwad, Adulting, Art of Living, AVIS Viswanathan, Fall Like A Rose Petal, Happiness, Intelligent Living, Parenting, Parenting Young Adults, Vaani1 Comment on Adulting is simple if you are ready for everything! It is time parents grew up too – and not just older! Whatever be the circumstance or temptation, parents must not get in the way of their adult children. Someone we know is looking for a marriage alliance for her daughter who is an alumni of the London School of Economics. We have met the prospective bride and found that she’s intelligent, compassionate and independent enough to make informed choices. But her mother insists on choosing a groom only from a TamBram, IT industry background so that the couple can “settle” down in Chennai in the next 10 years to be able care for her (our friend) in her old age! Another mother does not want a groom for her daughter from anywhere out of Chennai because she (the mother) has a ‘fear of flying’ – so outstation and overseas visits may not be possible if the groom came from outside Chennai! Yet another couple we know is ‘worried’ stiff that their 33-year-old son is unmarried – the son however believes that no alliance is coming through because his father insists on the girl’s side following a regimented process of match-making which most families find stifling – and avoidable! I am sure there are countless such stories around you as well – in your family, in your circle of influence. A lot of parents I know are sweating over their children quite unnecessarily. I believe parents must take a chill pill and let their young adult children just be. 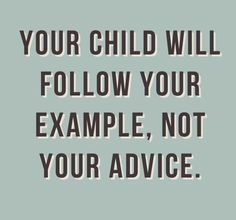 Most certainly parents have a need to counsel their children and share perspectives. But the engagement must stop there – at best with a sermon. Trying to micro-manage and live their children’s lives or live their own lives through their children is something that parents must totally avoid. Parents must appreciate – and accept – that their children are unique individuals. Their Life designs are entirely distinct and different from that of their parents. Besides, they have their own aspirations and their own lives to lead. So, coming up with preconditions, like choosing a companion who is in the same city, or one who belongs to a specific community or insisting that a child gets into running the family business because there is no one else to run it or dictating how a young adult must live, ruins the party for everyone. It is possible that some of all this happens because despite being young adults, the children may not always share how stifled they feel with intrusive and instructive parenting. But it is time children spoke their mind, even as it is time parents grew up – and not just older! Author AVIS ViswanathanPosted on March 1, 2016 March 14, 2016 Categories Art of Living, Inner Peace, Intelligent Living, Let Go, ParentingLeave a comment on It is time parents grew up too – and not just older!